As I ate my breakfast in the guestroom, I considered what the next two and a half days would hold. Sara and I (along with Diora, a translator) were scheduled to drive a couple of hours to the Savva Orphanage in Merke. 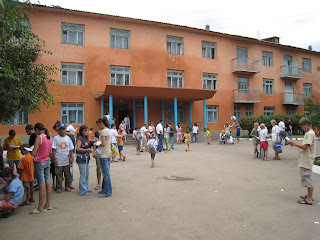 We would join a delegation of Americans and their translators who had already been at the orphanage for a week. They were part of an annual visit organized by Interlink Resources and held English classes and other activities for the 180 children at Savva. I had already heard what a significant time this was from my friends in Indiana who had visited on previous trips. 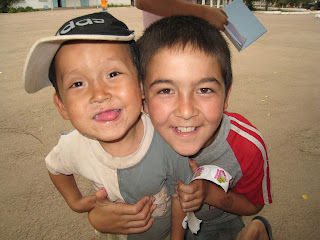 Also on my mind was the fact that one of the two children that I sponsored in Kazakhstan was at Savva. There were rumors that he was not on campus at the time and was instead living with an aunt in the village. I hoped that somehow I would get to see him. We had exchanged several letters, and earlier in the year he had sent me a very nice painting of a bull. It would be a shame to have traveled so far and not get to visit with him. I put the thought out of my mind as I packed a backpack and gathered my video equipment for the trip. The journey to Merke was uneventful and in some ways familiar. We were merely backtracking along the route that I had taken a day earlier from the airport in Almaty. When we drove through the gate of the orphanage, I was surprised at how large the campus was. There was a dormitory, dining hall, school, soccer field, power plant, and several other buildings as well. I was told that the orphanage was 90 years old. With the exception of the dining hall, which had been recently built, the rest of the campus looked to me to be from the 40's or 50's. It was clear that an effort had been made to keep in neat and clean. We parked and walked over to the open area between the main building and the dining hall. There many children and members of the American delegation. It was just before lunch, so most were just talking, throwing a frisbee, or writing good wishes in notebooks that all the kids seemed to have. There were an abundance of smiles, and it was clear that the children and adults alike were enjoying each other's company. The children's clothes were in good repair and they all looked to be in good health. Over the next few minutes, I met several delegates and children, all of whom greeted me warmly. A tall American approached me with a big smile. "I know you," he said. His name was Tony and one of his best friends had been on my talk show years earlier. As it turned out, his friend's wife was part of the delegation and I would have an opportunity to meet her later. We chatted for a bit, then headed to lunch. The food was very good, and it was clear that dill weed was a popular herb. I happen to like dill, so it was a pleasant surprise. During lunch I got to meet some more of the delegation and learned that several of them had made multiple trips to the orphanage over the years. Most were from Oregon, Virginia, and Indiana. I also met some more of the translators. They were university students, and like the delegates, some had made multiple visits. By the end of lunch, it was evident that something special was going on here. They all knew that they would be leaving in two days, but there was not even a hint of "I can't wait to get back" from any of them. I felt a bit awkward since I had arrived so late into the visit. I wondered what impact the two and a half days would have on me. Would I get to meet Mukbar (the boy that I sponsored)? Would I be able to encourage any of the other children? How would the experience affect me? After lunch, I took my bag to my room. There were seven us staying in a dorm room. We each got a small bed with a mattress of about one-half inch. There was a card table in the middle of the room and a fan near the door. The kids, I learned later, often stayed with 10 in a room and lived like this every day. I grabbed my video camera and when back downstairs. In the afternoon, there were various activities. Many of the girls (and a couple of boys) enjoyed getting their hair and nails done (and doing the hair and nails of the female delegates!). Others played in the sandbox, still others were on the soccer pitch. Others simply wandered around talking. I met a few more of the kids and they were quick with a smile and a hug. It wasn't long before I was signing their notebooks and being led around by the hand. There was a tangible joy in the air. Later in the afternoon was "quiet time." Sara wisely suggested that I take a nap (she must have known that I needed one!) and so I went upstairs to my bed. The mattress offered little support and the room was quite warm, so I predicted that I would get little sleep. I was wrong. I soon dozed off, and was only awakened when Ken, one of the staff members at Interlink, woke me up. Dinner was very good, as was the conversation. I was quite impressed by how well-behaved the children were during meals. They talked, but it was not the shrill cacophany that I was used to hearing as a teacher of middle school students. Afterwards, there was a break, then an arts and crafts night. The children were divided into groups and given one of three models to build and paint. I went from classroom to classroom videotaping and watching. Again I was impressed with their behavior. I saw no horseplay or rampant silliness. They were clearly having fun, but they had not pushed the limits as my students so frequently did. They also seemed to be grateful; there were no sullen teenagers here. After the arts and crafts time, the students wandered back to the open area in front of the main hall for a dance. Loudspeakers were set up and a constant flow of lively music (most often in English) poured forth. The kids loved it, and almost all danced at one point or another. The adults joined in as well, and the evening ended with many smiles and much laughter. Again I thought of my students back home and the dances that we had arranged for them. Did they have this much fun? When the dance ended, everyone slowly head back to their rooms. The little children had gone to bed earlier, but the older ones wanted to talk a bit more. I suspected that they knew that there was only one more full day with the delegation. Before going to bed, we had a chance to clean up. There were no showers, just a large building with a changing room and a bath room. What I mean by bath room is that it had several water taps and a bunch of buckets. All the men would go in, grab a bucket, and wait in line to fill it with water. Thankfully, there was plenty of hot water. You would then find a place to soap up. After that, you would pour the bucket of water on yourself. I found that it usually took two buckets to get clean. It was rustic, but it worked! After cleaning a day's worth of dust from my body, I returned to our dorm room. As I put my head down on my pillow that I night, I reflected on the day and what a blessing it had been. These were special kids. And these were special adults--some who had come year after year. And what about Mukbar? Would I see him tomorrow? I began to emotionally prepare myself for the worst. I was told that we could even go to his aunt's house and get him. What if he wasn't there? I tried to supress such thoughts and rather tried to fill my mind with the smiles of the children that I had met that day. Sleep came quickly. Tomorrow would be my first full day at the orphanage and, ironically, the last full day for the delegates.